This morning I watched the Indiana Supreme Court oral argument on VFW Post 2953 v. City of Evansville, a case in which the plaintiffs are challenging an Evansville ordinance imposing smoking ban on the city's bars. The ordinance makes an exception for the Aztar Casino located in Evansville. The ban was upheld by the Vanderburgh county court and the Court of Appeals. 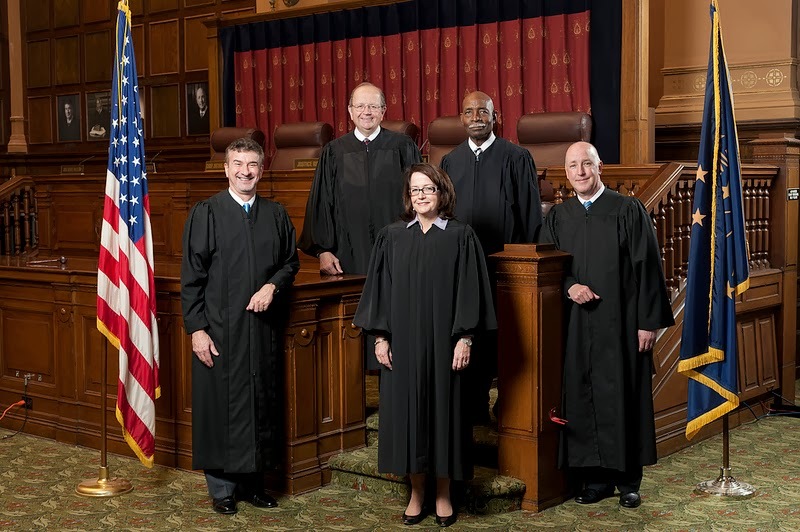 The Indiana Supreme Court though granted transfer, vacating the Court of Appeals's lengthy not for publication decision. The case focused on one legal theory, that the casino exception to the Evansville smoking ban violated Indiana's privileges and immunities clause. That clause effectively operates as Indiana's equal protection clause, which I would generally describe as prohibiting discriminatory treatment except when justified for a good reason. There is case law that says Indiana's privileges and immunities clause actually provides more protection than the federal equal protection clause. However, in 1994, the Indiana Supreme Court handed down the case Collins v. Day, which while distinguishing Indiana's privileges and immunities clause from the federal equal protection clause, indicated that much of the standard to be applied is the same. Trying to guess outcomes from justices questions and statements during oral arguments is always a crap shoot. But there seemed to be a disbelief among a majority of the justices that the exception in the Evansville ordinance would past Indiana constitutional muster. The City cited three justifications for making the exception for the casino: 1) Fiscal - the casino brings in a lot of money and a smoking ban in the casino would cause a loss of business; 2) Highly regulated - that the casino industry is subjected to even more regulations than the already heavily regulated taverns; 3) Out of Town Customers - most casino customers (over 80%) are not from Evansville. As a side note, I find it interesting that advocates of a smoking ban argue it would be good for business when passing it into law. Then when in court defending exceptions to that law, they argue the other side, that imposing it, in this case, on casinos would cost them to lose business. The plaintiff's attorney pointed out that bars in Evansville had lost customers as a result of the smoking ban and several had gone out of business. The justices did not seem to bite on any of the exceptions as being rationally justified. That most of the casino customers were not from Evansville to me seemed the strongest justification for the exception but the justices did not even seem to bite on that one. Chief Justice Dickson and Justice David seemed the most uncomfortable with casino exception, while Justice Rucker asked a number of excellent questions regarding the effect on the smoking ban in Evansville if the latest amendment banning smoking in bars is found unconstitutional. Perhaps Justice Rucker's questions were foreshadowing what he expected the Court to do. The fact that the Supreme Court took the case is noteworthy. If the justices wanted the ban to stay in place, the Court could have simply left the Court of Appeals opinion in place and even ordered that it be published. Instead the Court vacated it to decide the opinion.. My guess is much of that had to do with what appeared to be uneasiness the court had with Collins v. Day. The Chief Justice seemed to be very uncomfortable with the language of that decision that requires that, in any state privileges and immunities challenge, that a plaintiff "negative every reasonable basis" for the exception. My guess is that, by a 3-2 or 4-1 vote, the Indiana Supreme Court is going to strike down the Evansville smoking ban for including the casino exception. That would have an effect on many local bar smoking bans whicexceptions. In Indianapolis, for example, the law includes exceptions for VFW's, for the downtown off-track-betting facility and, perhaps most curiously, for cigar bars. If the Court finds the exception for the Evansville casino in violation of Indiana's privileges and immunities clause, it would appear that the amendment to include establishments which serve alcohol, with exceptions, would not survive. The political effect of such a decision would be to send many local legislative bodies back to the drawing board to redo their smoking bans. The problem for smoking ban advocates is that the thus far politically powerless mom and pop neighborhood bars, hit the hardest by the smoking ban, would suddenly have a new powerful political ally in casino owners who have been very successful in getting exceptions written into the law using the argument that a smoking ban will cost them customers and the city tax visitor tax dollars. Even visitor associations and city officials might begin to question whether it might be better to lift the ban on smoking in bars rather than lose out of town customers who might not choose to visit a casino if they are no longer allowed to smoke when gambling. I could be wrong, but I think the Indiana Supreme Court is poised to throw a curve ball to the smoking ban movement. I happen to support the smoking ban, based on preventing harm to workers. A bar that allows smoking is like a factory without safety equipment. This doesn't violate the bar-owner's property rights - he/she is allowed to smoke in their building as long as they aren't operating a business there. This nuance is generally lost on the pro-smoking crowd, who care only about money. All laws in Indiana must be as uniform as possible. There cannot be any exceptions, in other words. Not at the state or local level. Legislative whores exempted casinos and OTB because they are whores. Well, Unigov, the evidence that workers are harmed by second hand smoke is only a step, and a very small step, above raw speculation. Epidemiology studies only show a very slight association between second hand smoke and disease and that is after tossing out studies that show a protective effect. The "risk factor" in epidemiology studies is only 1.2 for cancer, 1.3 for heart disease (I may have flipped them.) You need at least a 2.0 association to find causation. Regarding your argument, the fact workplaces are regulated as a justification for smoking bans would justify all sorts of regulations. Maybe we should ban large, sugar laden drinks from being served in restaurants as well. Well it's people's choice to drink those drinks, just like it's people's choice to work or patronize an establishment that has smoking. At least you concede, or appear to, that smoking bans hurt businesses in bars. It was silly when smoking ban proponents were arguing that bars wouldn't lose any business if they ban smoking. Many of these businesses had clientele 90% of which smoked. Do as we say not as we do "government," is not a Constitutionally or otherwise credible concept. There's a Constitutional right to associate, even for folks enjoying legal products that some of us don't use.